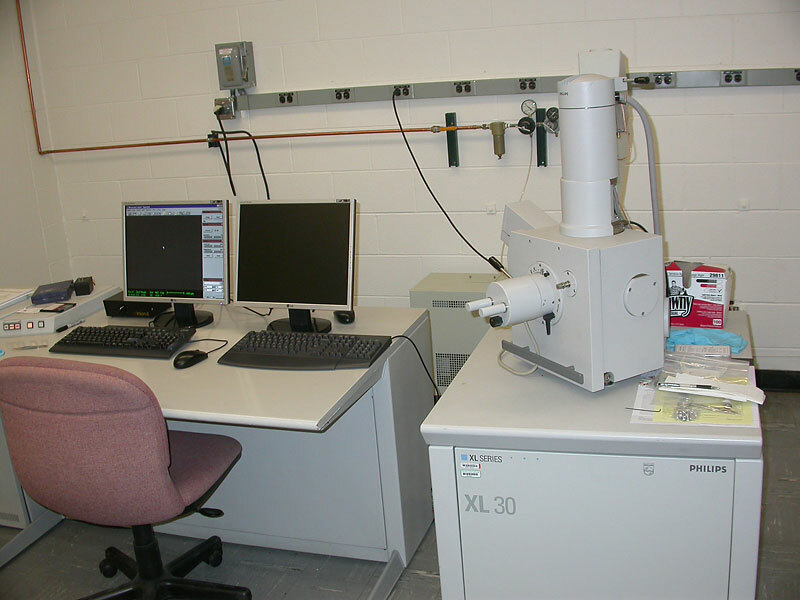 The research activities of the Corrosion and Mechanics of Materials Section are supported by complete metallography/sample preparation rooms equipped with several optical and electron microscopes: a Transmission Electron Microscope and two Scanning Electron Microscopes. Figure 1: Detail of JEOL 100CXII TEM. Click on image to view larger image. Transmission electron microscopy is a powerful tool to investigate crystallographic defects down to the nanoscale, and is a critical technique to study irradiated materials. The JEOL 100CXII, a 100kV TEM with a lattice resolution of 0.2 nm, is dedicated for microstructure observations on high-dose neutron-irradiated specimens. The work focuses on defect structure and microstructure evaluations. The examinations help understand various degradation mechanisms related to neutron irradiation. Figure 2: Philips XL30 SEM. Click on image to view larger image. 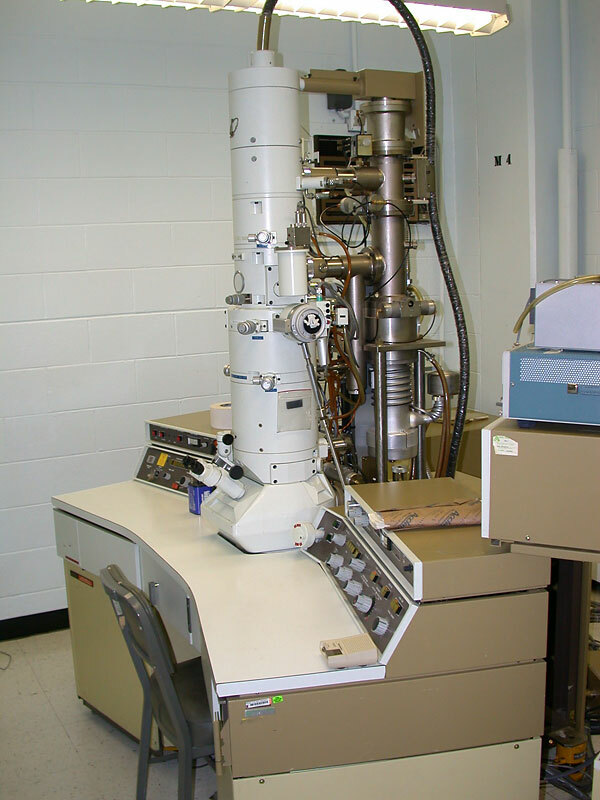 Scanning electron microscopy is the most powerful technique for surface characterization and quantitative analysis on corrosion and mechanical tested specimens. Two SEMs are currently available for various research programs in the section. One is a Jeol JSM 6400 SEM which has a resolution of 3.5 nm (at 35 KV- 8 mm WD) and is equipped with PGT image and EDS acquisition systems. 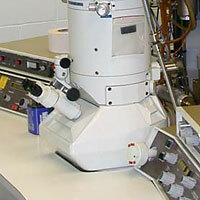 This SEM is used as a general purpose microscope for non-irradiated specimens. The second SEM is Philips XL30 which has a resolution of 2.5nm at 30kV nm, and is equipped with an EDAX EDS system. 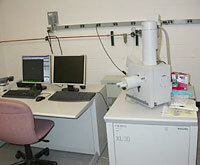 This microscope is dedicated for the examination examining radioactive specimens, and the column and operator desk are installed approximately 1ft. apart to allow for a lead shield to be installed around the column. This SEM has two control consoles, one of which will be installed outside the room allowing for remote operation. Corrosion and Mechanics of Materials Section: addressing specific concerns related to corrosion and mechanical behavior of materials used in several types of energy systems. Irradiation Performance Section - Experiments on the irradiation-assisted stress-corrosion cracking susceptibility, fracture toughness, and corrosion fatigue, of wrought and cast austenitic stainless steels and their welds.